Excellent customer service will win and earn you the trust of your freelance clients. They believe in you and are not afraid to bring more problems to you. Why? They know you will deliver while offering them outstanding customer service. You can create a foundation for all that and more with the campaign brief template. Use it to exceed client expectation. It’s essential for the success of any interaction you have with the clients. How does your consultancy exceed customer expectation with a campaign brief template? All good consultants excel at managing expectations. Client expectations should never be beyond your control. It’s good for freelancers to find ways of staying on top of all situations. Use this template to set yourself apart as an honest freelancer. Use it for under-promising yet over-delivering. Use it for anticipating the needs of your clients even before they realize their own needs. Create space for constant communication with clients too using this document. Complex solutions can create new problems for your consultancy. It’s important for you to learn how to overcome this issue. The first strategy is to make everything as simple as possible. One quality that the best freelancers have over everybody else is the ability to take complex situations and make them remarkably simple for clients. Give them an answer. Make the answer as simple and easy to understand as possible. Simplifying a client’s problems doesn’t equate to underrating them, though. Do this while letting clients know that you’re not taking them or their issues lightly. Freelancers have to motivate themselves to work on the issues that clients bring to them. A good consultant knows the importance of good motivation. It’s not impossible to find ways of motivating yourself, as a consultant. The motivation keeps you going on days when you don’t feel like working. It encourages you to put in a proper shift when everything else seems lost and uninteresting. The campaign brief template can act as a powerful tool for motivating yourself too. Be consistent in all your freelance relationships with clients. Be consistent in delivering quality to the clients. The consistency is a hallmark of all successful consultants. Clients love consistent freelancers. Do not give awesome A+ service only once. Instead, do it every time. Let your customers know that they can and should expect consistently excellent products and services from you every time. Otherwise, they would be disappointed. Whatever you do, you should never keep your clients waiting in line forever. Additionally, it’s important to learn how to listen to your clients. Listening helps you to get what they are trying to say. More importantly, listening offers you a window into their needs and expectations. You can then go beyond what they expect and deliver stellar product or service based on the information you gleaned after listening to them. Listening also proves that you respect your clients and take everything they tell you seriously. You’re more likely to learn something new about your clients by listening to them. You also increase your chances of learning something new about the project by listening. 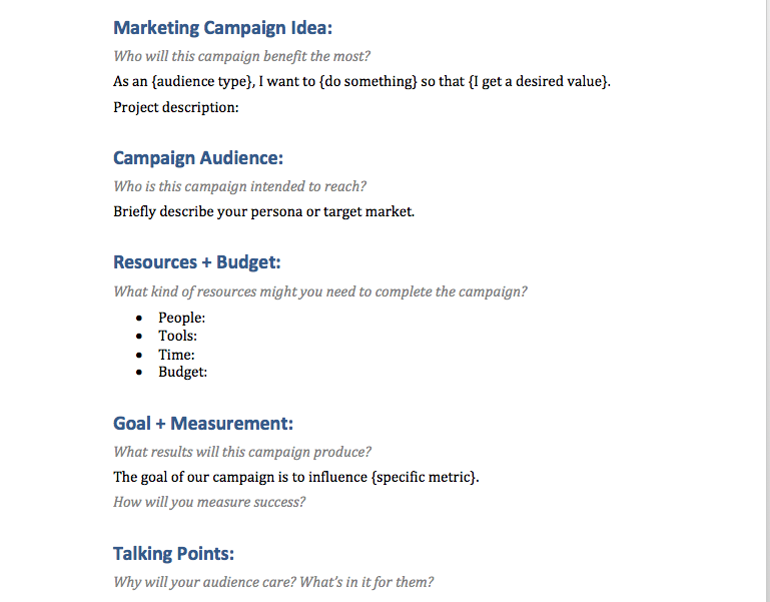 As you have already noted here, the campaign brief template is a wonderful document to use. It offers you more benefits than you will ever realize. The tool is powerful for growing a freelance business that stands heads and shoulders above its competitors. It boosts your freelance business. It pushes you to treat your clients in a way that allows you to exceed their expectations. Use the campaign brief template to build a consultancy that exceeds customer expectations.